Recently, Lori Nova celebrated her birthday. In honor of this, let me introduce her to you. Lori runs The Nova Studio in Point Richmond, California. Her studio offers a variety of bath and body care classes, soap making intensives, and general art classes. Lots of friendly folks come to her classes over and over again. I've taken several classes at Lori's studio: Liquid Soapmaking, Coloring with Confidence, Natural Perfumery, Hot Process Soapmaking, Artist Trading Cards, Advanced Melt and Pour, to name a few. Whenever I'm bored, I check out her website to see if there is something new to catch my eye. Lori has won numerous awards for her decorative soaps, and has been a speaker at the Handcrafted Soap Guild annual gatherings more times than I can remember. 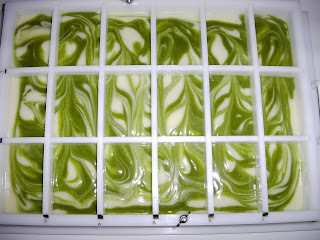 Lori is very active in the soap making and natural bath and body care DIY community and a valued resource. Yea Lori! What a NICE surprise to see your blog post Kaila! That was *very* sweet of you. I've learned so much from you over the years. You were one of my first contacts in the Soap World and were kind enough to open your "non-retail" store doors to me and that really helped get me started on a positive note, so also thank you for that! I'll be placing an order soon for the Mineral Makeup class that's part of my 4-day boot camp next Thursday, so I'll see you soon!